Transform your meats into a tasty supper! With Dean Jacobs Meat Rub. Get the most succulent flavor out of your Beef, Pork, & Game meats. 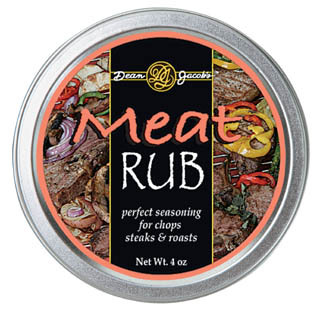 RUBS & SEASONINGS are all about succulent flavor and juicy tenderness. Rubs & Seasonings seal in flavor and moisture when grilling. These Gourmet Dry Rubs offer proprietary blends of herbs, spices and secret ingredients that tempt the taste buds and bring friends and family back for more! Makes a great gift for the grill-master in your family too!